"Men and women do tend to hurt each other" -- but in Trevor's convocations of the unprepossessing, no one is really devastated -- only gently deflected from dignity or coherence. As in The Boarding House (1965) and other Trevor establishments, the Women's Hospital ward contains the precise trajectories of imprecise lives, while outside, glimpsed briefly throughout, parades a grim female hoisting a "Liberation Now!" placard. Among the patients scheduled for hysterectomies are a Woolworth stock girl, unaccountably in love with a nimble petty thief; Miss Samson, facially disfigured manager of a quiet rooming house of "church folk," buoyed by her faith; and Elizabeth, divorced from a "chronically disappointed" husband and mother of three daughters, one of whom is off to an unbuttoned commune. Also in the ward is tiny Lily awaiting a baby, whose husband finally confesses his hatred of his parents and his abortive traffic with whores. The women go through the twilight nightmare of surgery. Miss Samson suddenly loses her faith, while Elizabeth must cope with the guilt over the possible suicide of poor Henry -- a gentle alcoholic, who "made a bog of everything" but exited laughing. It is Miss Samson, after the women have left the hospital, who, wise at last to her confusion of sacred and profane love, weeps for them all -- alone with strangers on a rainy promenade. 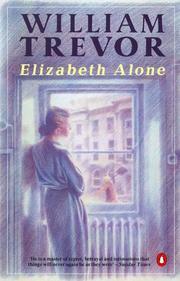 Again Trevor patiently stalks the blind tracks and intersections of little lives -- with wry-to-hilarious humor, a trace of sorrow and unwavering scrutiny. And as a story -- it's irresistible.